To understand using options and futures to manage currency risk; to understand options trading strategies in an environment in which exchange rate crises exist. 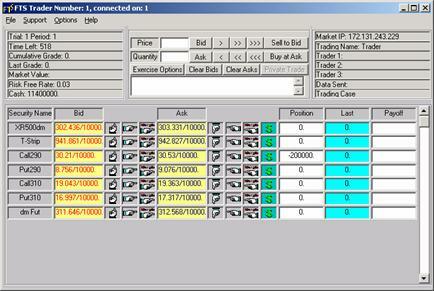 Finally, to gain experience working with a derivative trading support system. Currency option and futures pricing; option hedge parameters; implied volatility shifts. Currency markets can experience very volatile periods. For example, in the 1992 European currency crisis the implied volatility for sterling/dollars and dm/dollars jumped from the 11-12% range in August 1992 to in excess of 20% by October 1992 and then fell back sharply to above historic levels. A study by a US consulting firm (Barra) found that exchange rate movements affected fixed income and equity assets in a portfolio very differently. Approximately 80% of the volatility of fixed income returns and approximately 30% of the volatility of equity returns was attributed to exchange rate fluctuations. It is not surprising, therefore, that the demand for currency hedging is increasing. In this trading case you will face the problem of managing exchange rate risk in a currency crisis. That is, during each trading trial a currency crisis will occur at some point in time which is marked by a sharp increase in volatility. Although, the timing and the duration of the crisis is random, prices in the options markets will only provide signals that volatility is expected to increase near the time of the realized increase. You will compete against other traders in the FTS markets by earning grade cash with respect to a conversion scheme that is designed to both reward you for seeking out higher returns but penalize you for dropping below an acceptable floor. The operational details of this trading case are the same as for XR1. The major difference is that a significant shift in volatility will occur at some time during the trading year (trial). Each trader's screen will monitor eight markets: the exchange rate, a risk-free bond (strip) with 104 weeks remaining to maturity at the beginning of the period, European call and put options on the exchange for two different strike prices with a remaining life of 52 weeks, an exchange rate future contract, and a cash money market. The currency crisis is not interest rate related, so you can assume that the interest rates remain constant. Your trading objective is to earn as much grade cash as possible subject to the constraints imposed by your firm upon your trading activities. Securities are exchanged using market cash in a trading period that lasts for 52 weeks. Each 52 weeks is referred to as one trading trial. Multiple independent trials will be conducted. That is, at the start of a trial your initial endowment is either Type A or Type B, and an independent exchange rate path (starting from the spot lot price of around 300). Above $100,000,000 market cash earns the maximum of $402 grade cash for one trial. 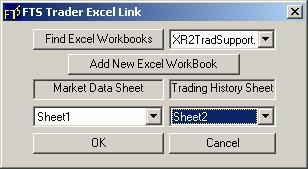 Download the trading support spreadsheet for XR2 (just below the ftsTrader link) from the Virtual Classroom page and open it in Excel. Note: Read carefully the appropriate Excel settings from the Virtual Classroom section where you download the XR2 support spreadsheet from. In trading case XR2 you are a short term “news trader.” You have information that lets you form a “market view” about the short term price behavior of the underlying exchange rate. In XR2 the price of the underlying exchange follows the geometric Brownian motion process assumed by Black and Scholes with one important difference. During the trading period at least one significant economic news event will occur that will result in the price of the exchange rate taking a jump. However, you do not know when the jump will take place or it’s magnitude and direction. In addition, there may be more than one significant jump (but there will be at least one). Unlike the real world you do not face any liquidity or capital constraints. You have an initial position in an option that you cannot trade, but you can trade the remaining derivatives (option and futures). As a result, your task is to manage your trading strategy so that it makes money if your view of the market is correct. At any time if you want to lock in your trading gains you can also manage the delta of your position. By linking to the XR2 support spreadsheet (you can download this from the Virtual Classroom page immediately below where you download the FTS Trader from). 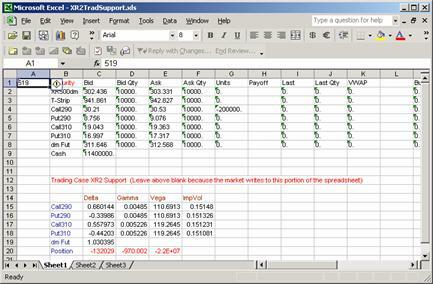 Excel Note for FTS Trader: If Excel is set to Automatic Calculate (Tools, Options, Calculations, Automatic) and you link FTS Trader to this spreadsheet, it will automatically recalculate your position delta whenever the exchange rate changes in XR2. Inferring Information from Implied Volatility Estimates: You should monitor the implied volatility in your spreadsheet because prior to a crisis you will observe in this trading case that implied volatility makes a significant initial jump. After the first jump it will then jump again and so you should think about how you can adjust your trading strategies to exploit this information.